Dichroic glass can be expensive, but it can also add a lot of color and creativity to fused glass for jewelry making. 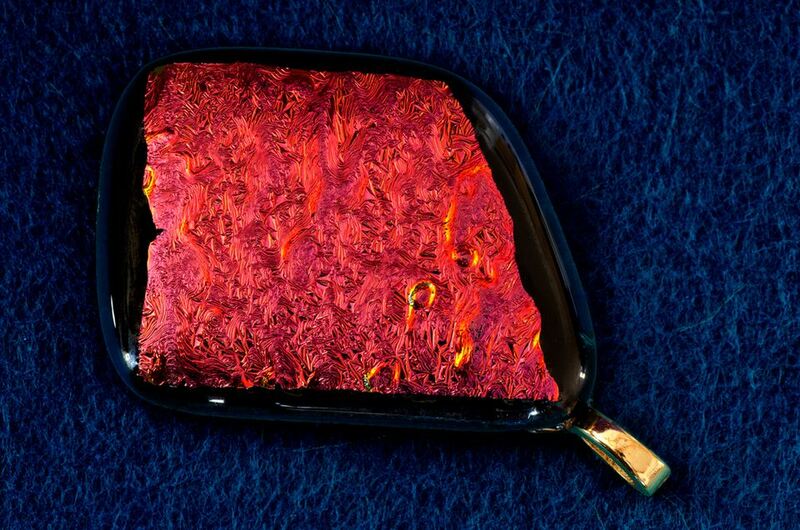 Dichroic glass is different from regular glass in that it may contain multiple colors or even appear opalescent. It changes color with the light and the angle at which it is held. Even if you are a beginning glass artist, you can make this dichroic fused pendant with minimal supplies and little to no glass experience. It does not take very much glass or a great deal of skill to make a simple design such as this pendant (photo). It is even easier if you think of it like a fused glass sandwich! You basically take two pieces of glass and stick them together with a jump ring in between them; at least that is the quick and dirty explanation of how to make this pendant. 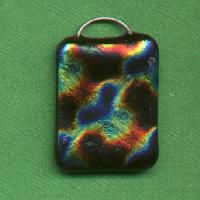 This tutorial will show you the step-by-step details you need to follow to make a Dichroic Fused Glass Pendant. The glass used for this project is specifically designed for fusing, so you cannot substitute glass used for stained glass or other types of glass hobbies. Fused glass is considerably thinner than other types of glass and has a particular Coefficient of Expansion (COE) that makes it perfect for fusing to other glass. Be sure that all glass used in a project has the same COE number. 1. Start with two pieces of glass, one black, and one dichroic glass. They should be about the same size, 1 by 3/4 inches. Clean all pieces of glass with a glass cleaner like Windex. 2. Dab some glue at the top of the black glass piece, and add a jump ring so half the ring is on the glass and half is hanging over. The part of the ring that is not split should be the part that is hanging over the edge of the glass. 3. If it is possible, it is a good idea to wait for the glue to dry a little before continuing. If you want to make a number of these pendants, it is helpful to make a number of these "blanks" (black pre-cut glass pieces) ahead of time so that you may work assembly-line style. Also, since it can take some power to heat up your kiln, consider making multiple pendants and firing them all at the same time so that you are not running your ​kiln for just one pendant. If you are doing this for the very first time, you may not want to make dozens of dichroic glass pendants until you get the process down as far as running the kiln and assembling the pendants. Also, you should fill up your kiln shelf to allow at least an inch or more between each pendant so that air can circulate around each one as it is fired in the kiln. 4. Next, dab some glue on the center of the black glass and put your dichroic glass on top of the black blank as if you are forming a sandwich. All kilns operate differently. Please be sure to read the instructions for the kiln you are using and use all safety precautions. 6. During the last 10 minutes, keep a good eye on the kiln so the pendant does not over fuse. 7. Open the kiln only part way to allow the glass to completely cool–but not too quickly–before removing from the kiln. 8. Finish the pendant by polishing the jump ring. There will be a small amount of fire scale on the jump ring after firing. Something to consider is that if you use dichroic glass that you can see through, you will see the jump ring. So, you might want to just use Dichroic glass that has black on the back. If you want to get fancier designs on your pendants, try layering dichroic glass or putting pieces together to cover the black piece as if you were putting together a puzzle. These look great if you want to just add them to a chain or create a whole necklace design around them.